The apartment “Le Logge” is made up of three en-suite twin/double bedrooms overlooking the garden, each with private toilet/bathroom; there is a fireplace in both the wide living room with kitchen-area and the elegant sitting room; from the lovely ground-floor sitting room, thanks to its gorgeous glass gallery, one can enjoy a panoramic view of the garden. In the very heart of the charming Tuscan countryside, among the smooth hills of Sienese Chianti and the fragrance of its green vineyards, you will find the Podere Lucignano Secondo Agriturismo, a mansion built in 1898, now elegantly restored and turned into an exclusive relais. The Podere Lucignano Secondo Agriturismo, ideal place for lovers of relax and nature as well as food-and-wine connoisseurs, provides its guests with a warm welcome and an exclusive service. The Villa is divided in 2 apartment: the apartment “Le Logge”. First floor: 3 en-suite twin/double bedrooms each with private toilet/bathroom, 1 living/dining room with kitchen-area and fireplace, 1 sitting room with fireplace. Ground floor: 1 sitting room opening onto the garden, 1 terrace, park, private parking place. The rustic apartment “La Mangiatoia”. Ground floor: 2 twin/double bedrooms with 1 shared toilet/bathroom, 1 kitchen, 1 living/dining room with fireplace, 1 terrace, park, private parking place. Van Transfer Service from / to Airports - Private Tour Driver Service. Traditional Tuscan Dinner Menu: The best of Tuscan cuisine “homemade”, prepared just for you in Villa. Regional specialties, local wines and a table elegantly laden will be the ingredients for an evening of authentic Italian style. EUR 80 per Person, Duration 3h, Min 4 People. Wine Tasting: A selection of the best Tuscan wines accompanied by typical cheese, to taste pleasantly in Villa. From red wine Chianti Classico Gallo Nero to white wine Vernaccia di San Gimignano. An exclusive wine experience, in the parlor of the Villa. EUR 80 per Person, Duration 2h, Min 4 People. Cooking Class: Learn the Italian cuisine during your stay in Chianti. You will know the most famous Italian and Tuscan recipes and tasty. Cooking class with dinner included. EUR 80 per Person, Duration 3h, Min 4 People. In the elegant Sitting Room there are two comfortable, large sofas and a marble and Tuscan cotto fireplace. The spacious Living/Dining Room, comfortable and elegant, is provided with a kitchen-area and a big fireplace, which will warm your after-dinner relax in the small sitting area, furnished with two comfortable armchairs. The Logge, definitely the most impressive room in the whole Villa, is a typical ground-floor portico in Alberese stone and Tuscan cotto, turned into an elegant sitting room looking out onto the garden. The well-kept Garden surrounding the Villa is rich in fresh shady places provided by tall, slender pine-trees. Strolling among the ancient olives, you will enjoy the natural fragrance of lavender, sage, rosemary and mint bushes. The wide Terrace in Tuscan cotto, overlooking the green tract of the surrounding woods, will be the ideal setting for your candle-lit summer dinners. The Lawn of Villa is the perfect place to relax while having a glass of good wine. EXCURSIONS IN CHIANTI: The whole area surrounding the Villa, in the heart of Sienese Chianti, is studded with mediaeval villages, churches and castles, easy to get to (some of them even on foot). 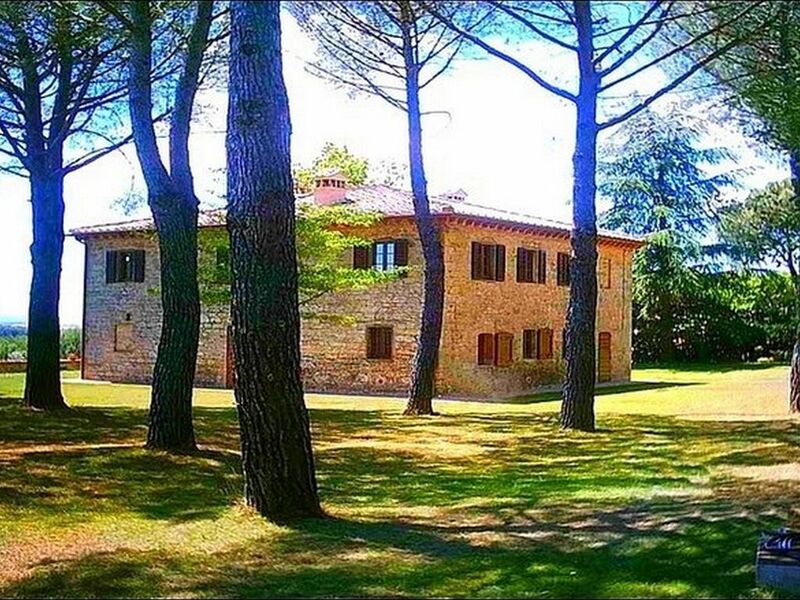 SIGHTSEEING TOURS OF TOWNS: The location of the Villa is the ideal starting point for cultural tours (even one-day long) of the main Tuscan towns. TREKKING AND CYCLING: For the lovers of trekking and cycling there is a wide range of charming paths and white roads crossing breath-taking landscapes. ART, MUSEUMS, EXHIBITIONS: The Provincia of Siena and all Tuscany boast a lot of museums known all around the world, where one can find all through the year Renaissance, Mediaeval, Ancient, Etruscan works of art. Moreover, very often, modern and contemporary art exhibitions are organised in the main towns, all easy to get to by car. MEDIAEVAL TRADITIONS: In the Provincia of Siena, which boasts a millenary history, a lot of mediaeval traditions are still alive: the Palio of Siena, Bravìo delle Botti. FOOD & WINE: The Villa is set in the very heart of Sienese Chianti, one of the most famous precious-wine-producing areas in the world. FAIRS AND MARKETS: Weekly Open-Air Market, all Wednesdays, over 500 sellers from everywhere in the Tuscany gather in Siena, about 15 km from the Villa: many of them sell women’s shoes and “Made in Italy” women’s wear. SHOPPING: At about 1 hour drive from the Villa there are many Outlet of prestigious Italian Brands, where you can buy with discounts up to 60% compared to normal shops. Outlet Val di Chiana Foiano (AR): Cavalli, Ferré, Laura Biagiotti, Versace. Outlet Montevarchi (AR) Loc. Levanella: Prada. Outlet Valdarno (FI) Loc. Leccio-Reggello: Gucci, Giorgio Armani, Ungaro, Valentino, Ferragamo. Outlet Rignano sull'Arno (FI): Fendi, Dolce & Gabbana.